Fit Tips for the Family – Just as it’s important for families to eat healthy together, it helps for families to stay fit together, too. Making it a family activity makes it fun and allows for bonding. However, much like regular family dinners it can help kids develop healthy lifestyle habits, that will continue for the rest of their lives. As hyperactive as kids can be, they do spend a lot of time strapped in car seats or high chairs, or sitting in front of the TV. Studies have shown that habits like these can lead to a sedentary lifestyle later in life while also increasing chances of obesity as well. Give kids an opportunity to properly hone and exercise their emerging motor skills. 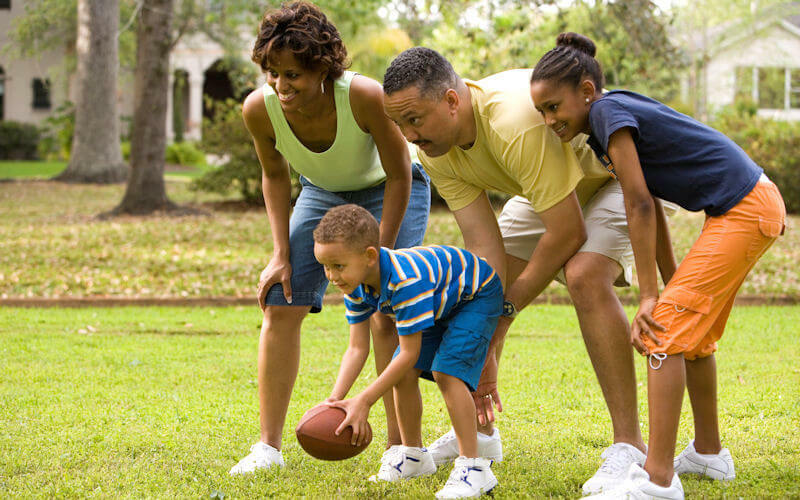 By staying active and strengthening their lungs and muscles in any one of these family-fun ways. Taking walks sounds simple enough, but working it into your day can work wonders for overall health. If you have a dog, going for routine walks with your child in tow can help them bond with their pet as well as get some exercise in. Whether you have a dog or not, incorporating pre or post-dinner walks with the family is also an easy way to work walking into your everyday schedule – plus it helps with digestion! This is a practice that is fast becoming a trend with adults who find little time to exercise, but want to relax and unwind after a long day of work. Commercial breaks allow you to get in as many activities before the show comes back on. Whether you challenge each other to jumping jacks or pushups, or even if you simply take a little walk around the house, using commercial breaks to get up and get moving can help your whole family feel like less of a bunch of couch potatoes. Game night is a great way to get your family together and spend some quality time. However swapping the board games for sports games can help shake things up as well as get you all moving. Playing in the yard, a park, or play out fun active games like charades, can be loads of fun and something different for a change. Exercising with your kids can create bonding time and build up self-confidence with kids. When kids see their parents working out, they will want to get in on the action too. It’s a great example to set for them and helps them realize that taking care of your body to keep it healthy and in shape is important. Mainly because it’s an opportunity to introduce a little fitness to the kids while giving them a chance to have fun with exercise. It’s also very important to show them good form with certain exercises, because learning to do it right is just as important as doing it at all.